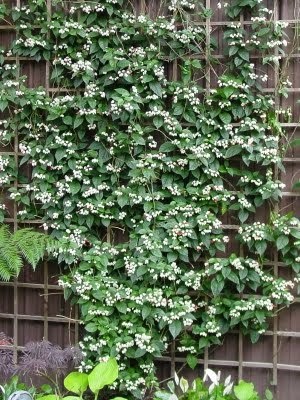 In Part 2 of this how-to series, I mentioned about a Bleeding Heart vine that was doing very well on a high trellis. The photo of that vine is shown below. The name of the proud owner of this vine is Jim R. Stevens and I learned of him from forums.gardnweb.com. Here's the specific entry in that forum. I asked Jim about his trellis' spacing dimensions and verified that the spacing is 8" by 8". The spacing is a bit tight in my opinion and decided that a 10" x 12" (height x width) would do. The photo above would be my inspiration for assembling my own version of a Bleeding Heart Trellis. Due to my location there are some other considerations though. A trellis made of wood is a termite-magnet in this part of the world so one that isn't made of wood material would be better. With the continued rains during the rainy season, exposed wood might easily rot. The trellis should be sturdy enough to be able to withstand the strong winds of 15 to 20 typhoons every year. Since it is at the side of the garage, the trellis needs to be thin and with a narrow footprint. It needs to be as close to the wall as possible. It should be able to cover almost the entire wall although it shouldn't be too heavy. With the above considerations, I concluded that a wall trellis made of steel wire would be better for my circumstances. Painting the steel wire trellis would keep it rust-free for a long time. See the continuation in Part 4. A garden design that involves growing flowers or ivy on the Trellises will yield a beautiful focal point. Plants and flowers will need a little help from you in finding the trellis but once that is accomplished they will thrive and fill in on their own. With flowers and plants you don’t have to worry about crowding.